We’d love to see you getting involved and lobbying for changes to animal welfare legislation or contacting companies to voice your concern regarding their policy. The Body Shop is now endorsed as a cruelty-free brand in our Compassionate Shopping Guide. 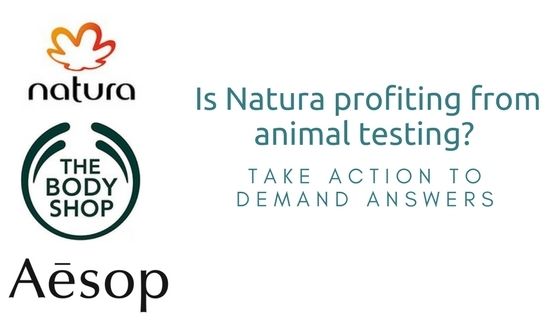 After hundreds of Naturewatch Foundation supporters wrote to Natura demanding the truth about the company’s animal testing policy, the new parent company of The Body Shop finally replied. Cruelty-free shoppers wanted to know if Natura was hiding behind meaningless statements, or if they were truly committed to ending animal testing for cosmetics. A Fixed Cut-Off Date policy is the gold standard of cruelty-free policies. It is the policy that a genuinely cruelty-free company must apply in order to be endorsed by Naturewatch Foundation in our Compassionate Shopping Guide. Naturewatch Foundation is calling for cruelty-free shoppers to demand answers from Natura about their animal testing policy. We have asked Natura simple questions about their animal testing policy for months, but they refuse to provide answers. Will Natura be the next L'Oréal? Will they continue trying to pull the wool over consumers’ eyes with meaningless statements? Or will they use their power to end animal testing? Click to take action today. After publishing our statement below, a representative of Natura contacted us. They have not yet confirmed their animal testing policy, however have committed to investigating whether Natura meets Naturewatch Foundation’s strict endorsement criteria. Our sincerest hope is that Natura and their subsidiaries are able to meet our criteria for cruelty-free companies. As a business that reports to take sustainability and ethics seriously, to have the seal of approval from the strictest cruelty-free endorsement scheme in the world could only be a benefit to their brand as well as, of course, to animals. Natura have pledged a goal to double The Body Shop’s earnings in the next five years. But until Natura and their subsidiaries meet our endorsement criteria, our call to boycott The Body Shop continues. The latest development in our long-standing campaign against The Body Shop is that L’oreal has sold the brand to Brazilian cosmetics giant, Natura Cosméticos SA. The sale completed on September 7, 2017 for $1 billion USD. L’Oréal blamed 'adverse trading conditions' for the The Body Shop's disappointing sales. However, since the brand’s takeover by L’Oréal in 2006, well-informed shoppers have become increasingly suspicious of the brand's 'ethical' message. Naturewatch Foundation supporters have been invaluable in helping spread the word that the parent company counts. This sale confirms that consumer power is a force to be reckoned with, especially when double standards are employed. Naturewatch Foundation and many of our supporters have attempted to communicate with The Body Shop’s new parent company over the past several months. Natura claims to not participate in animal testing, however as such statements are often hollow and meaningless, we have necessarily sought clarity. Does Natura operate a fixed cut-off date animal testing policy? Does the policy apply across all Natura-owned brands, including Aesop and The Body Shop? And does Natura, or their subsidiary brands, sell any cosmetic products in regions where animal testing is mandatory for imported cosmetics? Answers to these questions would confirm Natura’s commitment to ending animal testing for cosmetic products. But they are yet to respond. If Natura are genuine in their avoidance of animal testing they will operate a fixed cut-off date animal testing policy, and ensure this policy applies across all their brands, and in all regions. Why are they avoiding these simple questions? Until Natura are open and clear on their animal testing policy, our message remains unaltered: Boycott The Body Shop. To discover ethical brands that are genuinely cruelty-free, please refer to your Compassionate Shopping Guide, which includes the name of the parent company when applicable. Sign up for Naturewatch Foundation email updates to be the first to hear more updates as they are available.